Adidas has released the most recent Y-3 Future of Sports Fashion film, promoting the Adidas Y-3 Spring/Summer 2017 collection. The film traverses a futuristic dystopia where the protagonists, Louie and Zlata, find themselves on the wrong side of an authoritarian regime. This world is derived from the unique features and innate details that make up the S/S17 collection. From the artistic underground to the corridors of power, the film is a compelling investigation of political hierarchies. It questions the viability of privacy in a world of state-sponsored surveillance while revealing the shifting interplay between consciousness and memory. Strength, power, protection, creativity, and function struggle to co-exist in this disjointed world. Creative concepts were developed by Blackrose NYC. Filming was shot by director Robert Broadhurst, director of photography Aaron Platt, producer Kori Shadrick, lighting designer John Torres, set designer Anthony Asaro, VFX lead John Shafto, UI designer Toros Köse. Colorist was Paul Harrison at Freefolk. Sound was produced at Sonic Union by mix engineer Brian Goodheart, sound designer Owen Shearer, studio director Justine Cortale, scheduling producer Pat Sullivan. Music was by Son Lux. The A/W16 film offers a sneak peak into the world of Y-3 and the constant chase for something more. 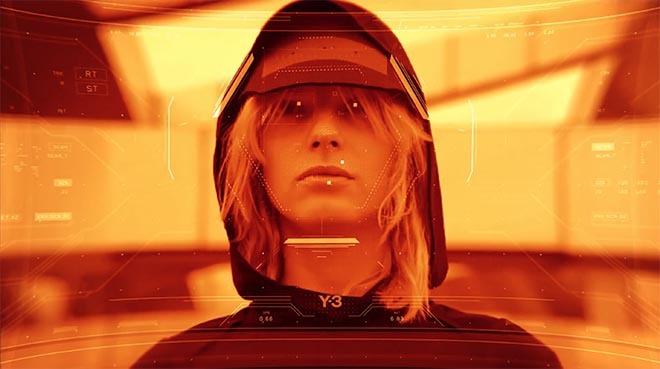 Featuring models Anton Toftgard and Kris Gottschalk, the film elicits suspense with the relentless pursuit of escape and change as a metaphor for the future of Y-3. Propelled by driving music and palpable suspense, the film mines the conceptual terrain of data culture and suggests a dystopian future beyond the expanding surveillance boom. With characters who can’t elude the peering cameras of a hacked security feed, it nods to the fault line between safety and surveillance and builds upon Yohji Yamamoto’s famous belief in ‘clothing as armor.’ The film suggests that, in a future where exposure feels impossible to escape, clothing may indeed become the final vestige of privacy. Creative direction was by Blackrose NYC. Filming was shot by director/editor Robert Broadhurst, director of photography Aaron Platt, producer Kori Shadrick, post supervisor Flora Guillon, VFX lead John Shafto, colourist Daniel Silverman, preliminary colourist Alex Delany, lead 3D artist Seth Minnich, lead compositor John Stanch, motion designer Tavet Gillson, additional designer Andrea Burrell, technical director Jon Smith, photographer Takay, asset photographers Chris Collie, Stas May & Adam Weiss, wardrobe stylist Carlos Nazario, hair stylist Peter Matteliano, makeup artist Souhi. Sound was produced at Sonic Union. Gemita Samarra and Gareth Taylor appeared in the Autumn/Winter 2016 film, as athletes running on the Isle of Skye, Scotland. The film tracks an ever multiplying algorithm of geotracking human bodies charting the landscape. Designed for motion and extreme pursuits the collection is put through its paces across the demanding terrain eventually morphing back into a single human figure surveying the open ocean. Filming was shot by director Nathan Gallagher via A Red Earth Studio, with director of photography Adam Docker, producers Ces Terranova, shoot producer Jack Daniel-Dempsey, editor Jon Coutts, sound designer Enos Desjardins, composer Max Herman. Aerial filming was by Mighty Sky Film. Gemita Samarra & Eyal Booker appeared in the Spring/Summer 2016 film as athletes pushed to the edge of their abilities before leaping off into a surreal isolation where gravity disappears and the grace and beauty of the clothes and the human body in motion take over. Filming was shot by director Nathan Gallagher with director of photography Adam Docker, sound designer Enos Desjardins, editor Jon Coutts. Post production was by Red Earth Studio.